SDR – Software Defined Radio… Well, I’ve been quite reluctant regarding “going digital” versus “staying analog”, but for a couple of days I’ve been playing with a SDR-IQ from RF-Space, and my verdict is: Yes! My other receivers, a JRC NRD-515, Palstar R30A and Sony ICF-2010 are still very good, but when it comes to the ability to dig up really weak signals from the mud the SDR-IQ stays untouched. Besides that, the SDR-IQ receiver itself isn’t much bigger than a pocket-size digital camera and I need to take the laptop computer with me to Vardø anyway – so this will save a lot of flight-weight for me when it’s time to move up north. Image the carrying weight if I needed to send up the JRC, the R30A and the ICF-2010… Guess that SAS and Wideroe would have one or two things to say about that. Another big pro with the SDR-IQ is the ability to record a bandwith of roughly 190 KHz and everything within this bandwith. Of course, this requires quite a lot of discspace in the computer, but I have that and therefore the decision making regarding this issue is a “no brainer”. Yes, there are SDR-receivers on the market, such as the Perseus and WinRadio Excalibur, allowing recording of even bigger bandwiths – but for now the SDR-IQ is more than enough for me. If I stay nice, maybe Santa Claus will bring me a Perseus or Excalibur for Christmas, hi! By the way, the antenna I’m using here in Biri is a Wellbrook ALA330S which I’m phasing against a 15 meter wire by the means of a MFJ-1026 phasing unit, and the Palstar MW550P MW-preselector when listening on the MW band. 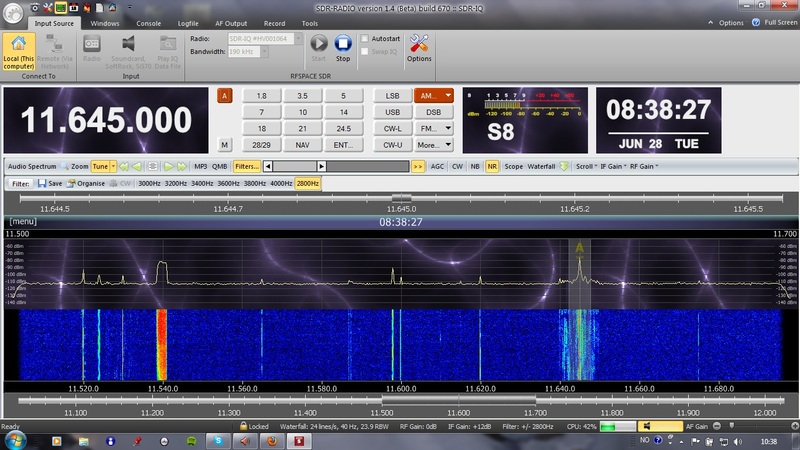 The software I use for the SDR-IQ is SDR-Radio.com. At first, I planned to erect two Wellbrook ALA-100 loops at my QTH, but after I got a hint in one of the later editions of Shortwave Bulletin about a german antenna that has similar specifications and is said to perform equally (or in some cases better) than the ALA-100, I immedeately got curious and decided to find out more. The antenna, or more correct; loop amplifiers (you supply your own antenna wire for the loop), is called HDLA and can be bought from Dirk Nees Elektroniek via the internet site activeloop.de. The cost for one loop amplifier and BIAS-tee for supply-voltage via the coaxial cable is very sympathic; 110.00€, if you place your order before the 1st of July (2011). After that, the price will be 135.00€ (which also is very sympathic). The price doesn’t include shipping costs. However, at this price, you almost get two HDLA’s for the same cost as one ALA-100. Definetely worth a try, right? My idea is to arrange two HDLA’s as delta loops on one support pole. Each delta-loop with a cirkumference of about 20 meters. Guess there will be some experimentation to find the optimal loop size. The loops will be arranged “K9AY-style”, with the exception that the loops will not be terminated. Instead I will phase the two loops by means of my MFJ-1026 phaser, which also covers the MW-band after a very simple modification. Hopefully these loops will work fine, and I sure hope that my final conclusion is that the HDLA represents the “best bang for the Buck”! From the living room windows, Hornøya Island (which is the easternmost island in Norway) can be seen. Vardø lighthouse is located on the island. The lighthouse is fully automatic, and nobody is living on Hornøya Island except a few biologists from the University of Tromsø who is doing research during the summer months. 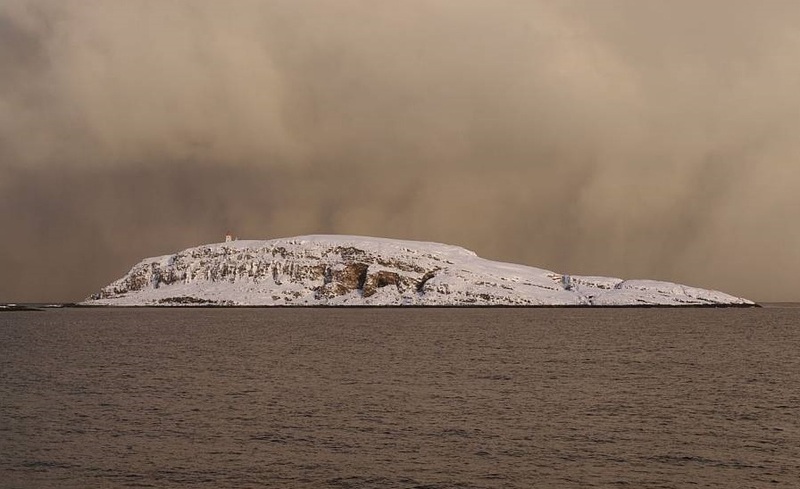 Hornøya er Norges østligste øy og ligger en drøy kilometer utenfor Vardø i Barentshavet. 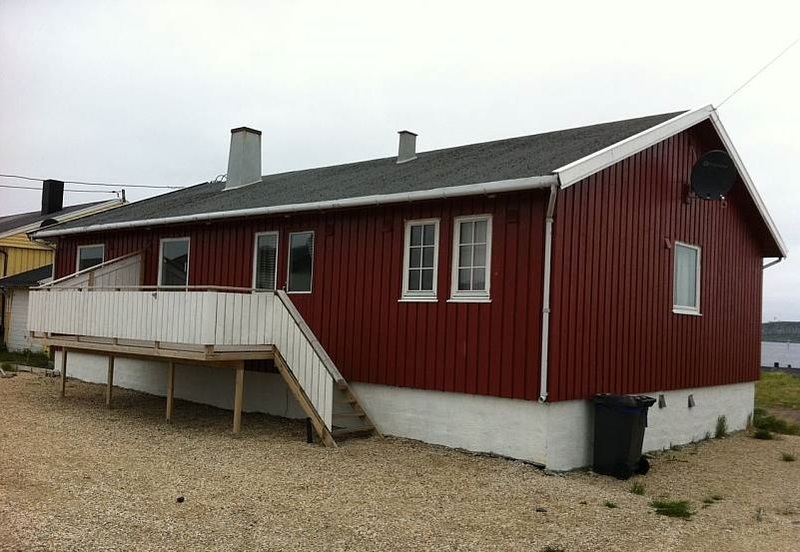 På øyas høyeste punkt (60 moh.) 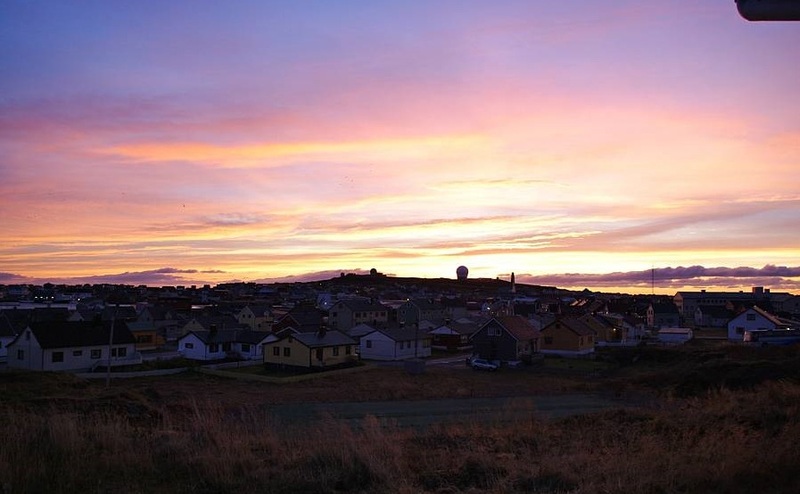 ligger Vardø fyr. Etter av fyret ble automatisert i 1991, er øya ubebodd, hvis man ser bort fra at noen biologer fra Universitetet i Tromsø forsker på øya sommerstid og bor i fyrvokterhuset. Øya består av sandstein og skifer og måler ca. 900 ganger 650 m. Den har bratte stup på vestsiden, mens østsiden skråner ned mot havet. Avslutninga dannes på denne sida av ei halvøy, Store Avløysinga. Lille Avløysinga er en holme som ligger rett sør for Hornøya. På vestsiden, mellom Hornøya og naboøya Reinøya ligger Prestholmen. 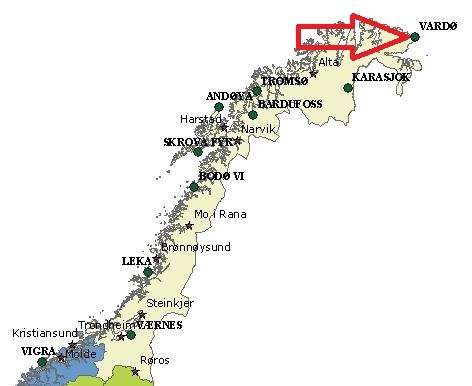 Hornøya har en av Norges største sjøfuglkolonier. I de bratte fjellsidene hekker totalt mer enn 40 000 par av alke, lomvi, krykkje, lunde, polarlomvi, storskarv, teist og toppskarv. Ellers på øya (og Reinøya) hekker store mengder gråmåser samt svartbak. Andre fuglearter er brushane, linerle og et par ravner. Spesielt polarlomvien tiltrekker seg fugleentusiaster langtveisfra. Øya er fredet som naturreservat, og det er ikke tillatt å begi seg inn i fuglefjellet. På ulike steder på Hornøya finner man rester etter tyske bygningsanlegg fra andre verdenskrig. Here’s the view to the east, seen from the house. As you can see, there’s mostly small houses in Vardø and there are no blocks of flats to be seen. Nice. 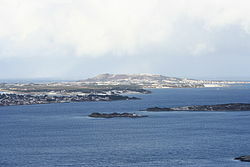 In south-east, the radar dome which belongs to the Defence Forces is seen as a small “golf ball on a peg” a few clicks to the right from the middle of the picture. Further south (not seen in this picture) one can also se the big antennas belonging to Vardø Radio. Got some nice pictures of the house today. The owner has granted me permission to use them, so I publish one of them here. Pretty nice, right? 130 square meters and recently restored indoors. Beautyful views in all directions from northeast to south. Ok… I’m moving north. Far north. Got a job in Vardø, the easternmost city in Norway and also the only city in Norway situated within the arctic clima-zone. By the end of August I´m getting there! Moving up to this area will let me experience a completely new and different aspect on DXing the mediumwave and tropical bands. Ok, yes… I’m moving up here just before the peak of the 12 year solar activity cykle, which occurs in May 2012. Bad timing, huh?? Well, even if the band conditions mostly will be poor and/or disturbed, I expect to hear radio stations that I could only dream about hearing before I got this opportunity to move up north. 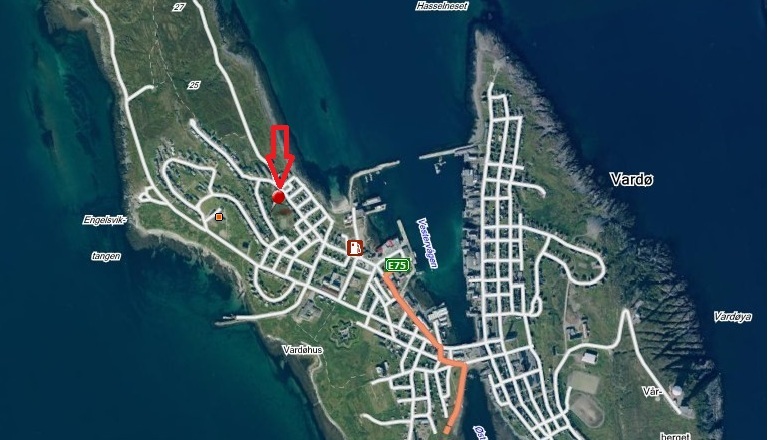 This blog is about my preparations for the move, choice of receiving equipment and antennas – and when I’m settled in Vardø – what I actually have heard up there.